Why Opt for Our Pane Cleaning? Enjoy of a risk-free service in Harold Wood that has received over 95% of positive customer feedback! Q: Who will be tasked with washing my casements? A: Your panes will be treated by a team of certified and reference-checked window cleaning adepts. Q: What services does window cleaning Harold Wood cover? A: The cleaners will carry out exterior window cleaning with the help of the latest water-fed pole equipment on the market. For properties above the fourth storey, we'll send in seasoned climbers for rope access window cleaning. For inside pane polish, the team will resort to standard ladders and squeegees. Q: Can you still deal with smeared grime on a cloudy day? A: A handful of raindrops won't undermine the Harold Wood window cleaners' work – rainwater is usually limescale-free. However, if we face a cloudburst, then we will kindly ask you to suspend your session for another day. 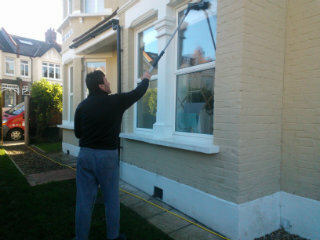 A: Yes, any PVC or UPVC frames and sills that your building features will be cleaned for free as part of our service. Q: Can you carry out your service while I'm out of town? A: As long as the specialists can walk past your front gate, they can rinse away all muddy streaks without you having to be close by. If your panes need a proper in-house polish as well, then we'll perform a swift key pick-up and delivery service. A: Usually, the filtered water tank inside the team's washing van is always full. In case the tank is empty and with your permission, the technicians can easily link the water-fed pole to any accessible water source. Q: Do I need to meet any specific requirements before the team knocks on my door? A: Once we inform you that the team's on their way, you'll need to make sure that they can enter your domain unimpeded. In addition, the specialists will need a parking slot within 30 metres from your property and on the same side of the casements you want polished. Q: What will happen if the team is running late? A: If the team is nowhere to be seen because of serious traffic, we will notify you about the setback and get in touch with you as soon as they arrive. When you opt for a window cleaning Harold Wood session, you'll be able to rejuvenate the casements of any property at fair fees that remain unaltered by minimum contracts or hidden payments. See if you agree with our point of view – stop by our user-friendly price table below. Irrespective of where your streaks have taken refuge, our capable window cleaning in Harold Wood will fight them off with ease. We have covered a number of washing methods. Our external window clean is aimed at premises with no more than four storeys. To let the daylight back inside, the window cleaners in Harold Wood will come in a caravan, outfitted with a retractable water-fed rod. This equipment is attached to a water storage, filled with filtrated water. After being pushed as a powerful gush from the pole's brush-head modification, the liquid will erase all smears in an attempt to regain its original structure. To access dusty window corners of multistorey buildings, we'll send an established team for rope access window cleaning. These certified abseilers will employ well-maintained ropes and harnesses or deploy ladders and cherry pickers to bring back the allure of your panes. We've got all essential COSHH documentation in place and follow every safety requirement. To make the inside side of your window façade just as lustrous, the technicians will utilize the ordinary ladder and sponge cleaning approach. We are pleased to report that our window cleaning in Harold Wood has been booked by several adjacent districts as well. You can learn which locations we visit below. Another quick and easy way to get a free instant quote or to book window cleaning services Harold Wood RM3 is through our web site.